Lately I have been loving podcasts. I listen to a variety of shows but I especially like to listen to career and creative podcasts when I am working at home or in a coffee shop. 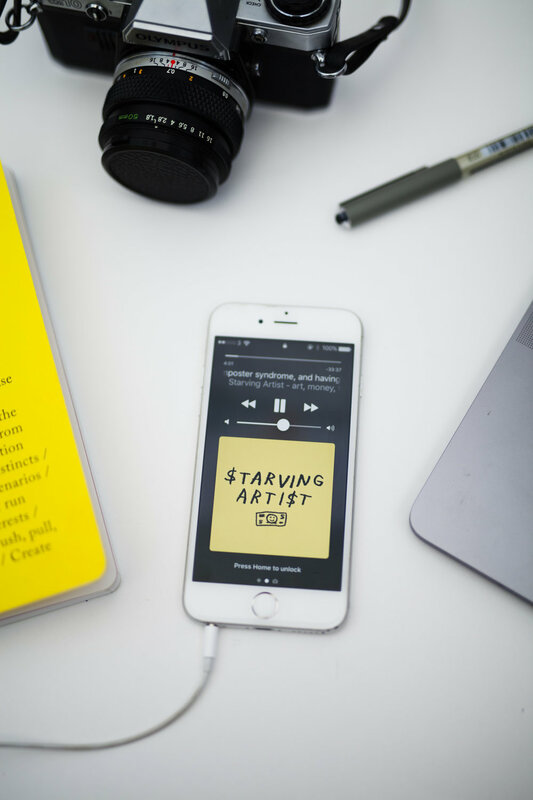 Today I want to share with you four podcasts that I am currently loving. as inspiration both creatively and professionally. My favourite podcast has just started on its latest series of episodes and I couldn't be happier. Girlboss Radio is hosted by the chief girlboss herself Nasty Gal founder Sophia Amoruso. On her show she interviews boundary pushing girlbosses who have found success in cultural, creative and business ventures. Sophia has a real way of connecting with her co-hosts and puts them at ease to open up and reflect on their careers. Extracting grounded advice from what they have learnt along the way. This show is funny, honest and so inspiring for any aspiring girlbosses. Another more career focused podcast I love is Being Boss which is hosted by creative entrepreneurs Emily Thompson and Kathleen Shannon. Like Girlboss Radio Being Boss is structured mainly on conversations with inspiring female creative entrepreneurs, focusing on finding confidence and getting real advice. What I like about this show is the variety of guests and advice from both the guests and the hosts. Being Boss also releases mini-sodes which are advice driven short episodes without guests which are a great source of quick inspiration if you have to take a quick walk to the shops or bus journey. Creative Pep Talk is exactly what it says on the tin. In this show graphic illustrator and speaker Andy J. Miller offers passionate advice to help creative entrepreneurs, professionals and freelancers find the perfect balance between making art and business. A one man show with the occasional guest, creative pep talk is filled with personal stories, analogies and artist interviews to help inspire creatives to achieve successful careers as artists. This is the perfect podcast if you are experiencing a lull in your productivity. Andy's insight and experience really adds value to the discussions and his enthusiasm and love for what he does is infectious. I always feel so motivated after listening to his show. My final recommendation comes in the form of a relatively new podcast show from Melbourne based multi-disciplinary artist Honor Eastly. In her show Eastly interviews successful artists about how they make a living from their work and gets down to the nitty gritty about their financial situation. This podcast provides insight into how successful artists combine art and money and topics include everything from freelancing to negotiating a raise in the arts. What I love about this podcast is that it breaks down the taboo subjects of money and the struggles that come with trying to make a living as an artist. What the interviewees reveal to Eastly is often surprising and heartening to hear, particularly as a soon to be creative graduate. The conversations often take a more philosophical turn covering topics such as ethics and values which I also find really refreshing as a listener. If you ever find yourself wondering how you can make a living as an artist then you need to listen to this podcast because it will give you a fresh perspective on how you can make it work. And that concludes my current favourite creative/career podcast shows. If you have any recommendations of new podcasts I should try please comment them below!